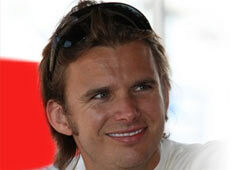 Briton Dan Wheldon is confirmed to have died after a horrible crash in today's IndyCar season finale at Las Vegas. The crash involved 12 cars on a high speed oval, but while all other drivers came out without too much injury, Dan Wheldon unfortunately did not make it. Wheldon was the 2005 Indy Racing League IndyCar Series champion, and won the Indianapolis 500 twice, in 2005 and 2011. Immediately after the incident, the race was halted, and later cancelled. After all drivers were informed of the situation of Wheldon, they decided to complete 5 laps around the circuit as a tribute to the Englishman. The crash itself was horrible, and it may be a surprise that nobody else got severaly injured as well. Wheldon's car though showed severe impact damage at the roll hoop, likely causing a fatal neck injury when the car hit the fences. Dan Wheldon was 33 years old and leaves his wife Susie Behm behind, as well as his two sons, Sebastian (born 1 February 2009) and Oliver (born 19 March 2011).